Kathryn Taylor Chocolates in Eastsound Square opened in June of 2008. It’s an intimate space with quiet corners to settle in and sip a cup of chocolate. In the summertime there are a few coveted tables in the courtyard. We’ve been surprised by the shops reception in our little village. Some faces we see every day and know their favorites well. We are often asked if we know what so and so’s favorite coffee or bon bon is (and usually we do know), so that someone can take their friend a special treat. The Easter Bunny herself visited us last year for a few last minute needed things and surprised a few children sipping cocoa. At Christmas that first year we asked Matthew Olsen the local violin teacher if he would bring his students by to play a few songs, and wearing tuxedos and evening gowns 6 little violin players gave an amazing performance to some very charmed guests. Now those children come, open their instrument cases and play in the square on a sunny afternoon. We’ve gained new friends from all over. We finally put out a guest book because we couldn’t believe where people were telling us they were from (East Timor, Spain, British Virgin Islands, Munich, Iowa) and we wanted to remember in some way all the fun stories we’ve heard. 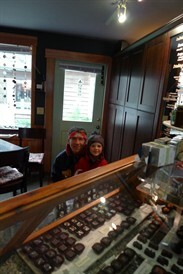 As chocolatiers, Orcas Island is an especially wonderful place to be. We have the benefit of local organic foods to work with, a wonderful warm community, and visitors from all over to share our passion for exacting craftsmanship and fresh goods in unexpected combinations. The shop has turned out to be a place where locals gather and visitors find their local haunt while on holiday, the regular guests mixing in with newcomers and strongly recommending their favorites. We really do on occasion see locals buying a bon bon for someone they’ve never met…"here you just really need to taste this." As our space is tiny (and full of chocolates, cakes cookies, lots of drinking chocolates and Stumptown Coffee) it coaxes a desire to relax and enjoy a quiet Orcas Island moment. We hope you will find it a peaceful, enjoyable and delicious island escape. © 2019 Kathryn Taylor Chocolates. All Rights Reserved. Powered by VSM.